My Dinosaur Is More Awesome! 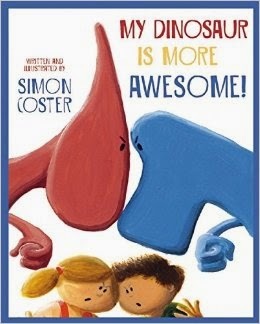 by Simon Coster is a picture book for kids 3-5 year old which Tiger girl and I recently read. The story begins at dinner time with the siblings Joel and Olivia. Joel and Olivia were sitting down to dinner one day with their two favourite dinosaurs when they started talking about their dinosaurs. ” My Dinosaur is better then yours. This proclamation by Olivia started off a chain reaction between Olivia and Joel as they started bragging about how their dinosaur is much better then the other one. Both of them gave exaggerated claims about their dinosaurs abilities as they started to argue and moan at each other. Olivia and Joel came out with some of the most fantastic validations of their dinosaurs capabilities like the following statements. The argument goes on and on till their mom steps in and halts them. She then tells them that she too has a dinosaur and hers it the best of all. With that she shuts both the kids up and made them sit down and finish up their dinner. Reading the book with my 4 yr old reminded me of how it is in my family. The older boys are often arguing with each other at the dining table during dinner and trying to outdo one another . Children love to compete with each other and try to show that they are more superior then the other. Such competitive behavior is something which I do not condone and I’m glad that the mommy in the story put a stop to such negative behavior. Tiger girl and I love the illustrations of the dinosaurs in the book and all the exclamations that both Olivia and Joel came up with. It was certainly a fun read for us which conveyed the message that bragging is certainly not condoned. I love when a book gives a positive message or few. Sounds like a definite good read!